What Is The McGill Advisory? Your resource to reaching your financial goals faster—with greater confidence and less stress. Discover why thousands of your colleagues trust The McGill Advisory. Most dental clinicians pay higher taxes than they need to—because they don’t know the legal strategies available for reducing their tax bill by thousands of dollars annually. Learn proven techniques for managing your office that can boost revenue and reduce costs to increase your practice profits by five figures or more. Too many doctors allow their hard-earned money to slip through their fingers. Discover precautions for ensuring you conserve what you’ve rightfully earned. A rewarding retirement is not automatic—it takes a strategy. Find out what smart doctors do now to fulfill their future dreams. Concise 8-page monthly issue, written exclusively for dentists and specialists, with strategies and advice to help you create—and protect—the wealth you’ve earned. Save time, save money, and manage your practice more effectively with resources and solutions such as timely reports & bulletins, financial calculators, templated forms/letters, and more. Plus–a member favorite–Q&A, where doctors’ common business and financial questions are answered by our top experts. Take advantage of discounts and savings available to you exclusively as a McGill Advisory member. Save up to hundreds of dollars off webinar and seminar course registration fees. Discounts are applied automatically during online registration when logged in to your active account. To register by phone, or to redeem a voucher, call McGill & Hill Group’s CE department at 877.306.9780. After your 2-year membership anniversary, receive one voucher valid for one free webinar (live or archived) hosted by McGill & Hill Group. After your 5-year anniversary, receive one seminar voucher valid for complimentary attendance to one half-day* course hosted by McGill & Hill Group. PLUS–Receive an additional seminar course *voucher for each additional 5 years of membership! *Vouchers can be applied as a percentage off a full-day or longer series. Formats vary – more details upon request. Vouchers cannot be redeemed for cash. Get news alerts, article highlights, and reminders from Editor John McGill–with strategies to increase practice profits, lower taxes, protect your wealth, and more–plus exclusive membership offers. Stay up-to-date on retirement plans, investing, tax, accounting, and personal/practice matters critical to securing your financial future–hand-picked just for you by McGill & Hill Group's top advisors. 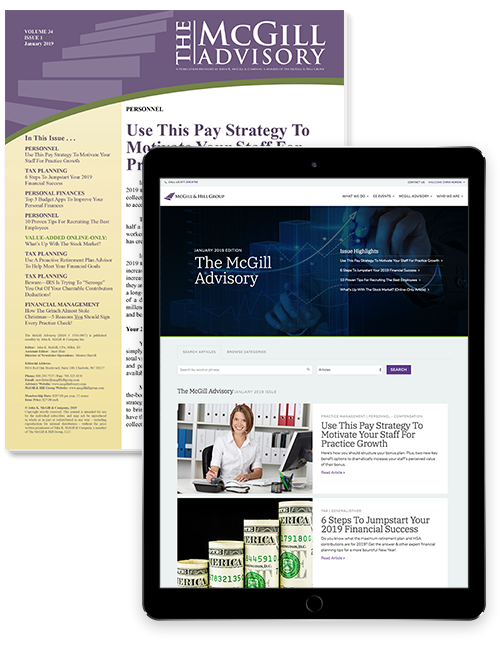 The McGill Advisory gives you advice to add thousands of dollars annually to your net worth – or receive a full refund.